The Forest Clan, KORPIKLAANI, returns, so raise your Sahti or Karhu—Finnish beer, for your edification—and get ready to rock out once again. Hold up, though, because in the case of the group's 10th album, "Kulkija", translated as "wanderer," the fast-flinging hummpa with which the folk metal basher has made its reputation takes a large backseat. The 70-plus minute "Kulkija" is a less frenzied, far more refined journey in song. Founding member Jonne Järvelä describes "Kulkija" as more of a "real album," thus the results are less bluntness and a bigger reinforcement of KORPIKLAANI's lush folk elements courtesy of Sami Perttula's accordion and Tuomas Rounakari's fiddle. "Kulkija"'s overt focus centers upon folk, trad rock and whiffs of prog—key example the 9:46 "Kallon malja"—with metal serving more as a primer with which to build this intricate album. Give "Sillanrakentaja" credit, however, as a doom-fried slab of heavy. "Kulkija" roars out of the gate with "Neito", one of KORPIKLAANI's traditional speedster jams, effectively setting its muse upon his extensive journey with a kick. "Neito", translated to maiden, is a double entendre of sorts: the wanderer is seduced by the maiden of the road, while his real-life maiden stays behind, awaiting his return. The tone of the album then changes with "Korpikuusen kyynel", where Sami Perttula and Tuomas Rounakari are given wide berth to spring in time to Matti "Matson" Johansson's bouncy rhythm. This album also gives Jonne Järvelä equal air to show off his dynamic ranges, for instance, coaxing more than growling on the seafaring yarn "Aallon alla". Rolling in low keys for much of "Harmaja", a wistful number about anxiety and homesickness, Järvelä takes cue from Tuomas Rounakari's weepy violin on the song's melancholic choruses. The difference maker in KORPIKLAANI's songwriting mentality for this outing means "Henkselipoika"'s vigorous moshes never veer too quickly. They instead merge with slower folk progressions while retaining a vivacious cheer section. It also means seeping a children's choir into "Sillanrakentaja", inclusive of Jonne Järvelä and guitarist Kalle "Cane" Savijärvi's kids. 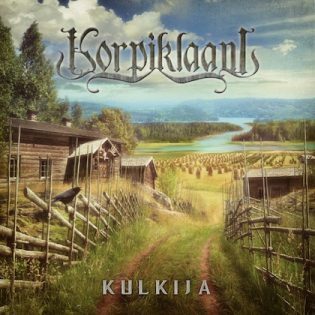 It takes a couple of listens to fully appreciate what KORPIKLAANI has achieved on "Kulkija". If you find yourself thumbing over your rack in search of "Spirit of the Forest" or "Voice of Wilderness" midway, hang tight: "Kulkija" will root itself within your ears sooner than later.